SPICE IT DOWN. It is some students’ favorite time of the year. Fall season is here! However, with the spooky season full of excitement, also comes some controversy. Such as, Pumpkin spiced flavored goods. Some love them and some hate them, make that me, especially me. Sorry…. I know I know, I just don’t understand all of the hype behind pumpkin spice. To me, fall is about flannels, cooler weather, and pigging out on Halloween candy. It should not be about pumpkin spice scented toilet paper, or the thousands of other pointless seasonal pumpkin spice products like; pumpkin spice Oreos, pumpkin spice Pringles, or heck, even pumpkin spice Peeps Marshmallows. Now, are you kidding me? Peeps Marshmallows are bad already, and then you’re going to create the most disgusting Halloween concoction ever by adding pumpkin spice? C’mon Peeps, get it together. Now that we’ve gotten the disgusting products out of the way, what is pumpkin spice? So why don’t we just start calling it spice? 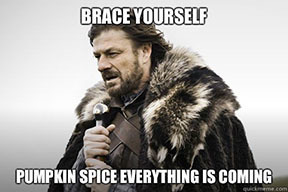 According to sanfransiscobaycoffee.com, there is not a single trace of actual pumpkin flavoring in pumpkin spice. Most ingredients included to create this flavoring usually include cinnamon, cloves, ginger, nutmeg, and vanilla. Yes that is right, your favorite pumpkin spice macchiato coffee from Starbucks contains no actual pumpkin. Sorry people, I don’t mean to sound harsh, but you’ve been living under a blanket of lies, thanks to the evil “Pumpkin” Spice flavoring. A poll conducted at the high school proved that there’s no hope in the destiny of our school. Results shown that among 30 students and teachers, 46% preferred pumpkin spice while 54% said it wouldn’t be their first choice or they didn’t like it at all. No, that’s not a joke, our school is absolutely nuts. Nearly half of Valley Heights are wild creatures that I like to call, “Pumpkin Spice Lovers”. Thank goodness, with October coming to an end it’s only a matter of time until this pumpkin spice epidemic is over. Unfortunately, in just another month or two, coming to your local everything is yours truly; balsam fir and peppermint flavoring-the second most annoying holiday trend known to man.